According to an article by Alan X. Reay that appears on hotelnewsnow.com, the number of CA hotels in default or foreclosed on jumped 125 percent in the last 60 days and the state now has 31 hotels that have been foreclosed on and 175 in default. Not surprisingly about 87 percent of the hotels in default are non-franchised hotels. Also, 75 percent of the hotels that are in default were either purchased or refinanced between 2005 and 2007. 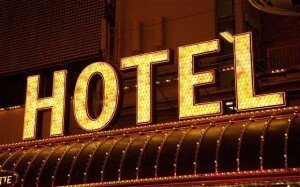 The author estimates that hotel values are currently 50-80% lower than the peak as a result of declining revenues. This entry was posted in News & Notes and tagged hotel bankruptcy, hotel occupancy by TrueGuest. Bookmark the permalink.